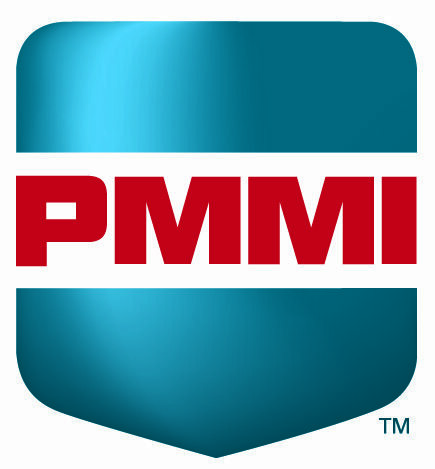 A component of a sensor for a consumer product was made of a plastic material that was susceptible to damage from vibration. 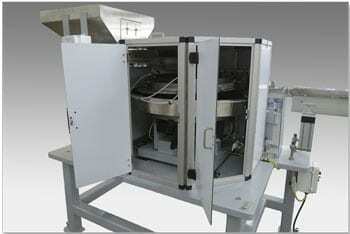 The assembly operation also required that the parts be kept as clean as possible. We designed a custom parts feeding system that combined a vibratory feeder bowl and straight line track with belt conveyors to provide an effective solution to these unique design challenges. A bulk supply hopper provided 3 cu. 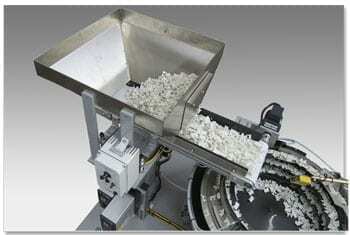 ft. of bulk parts storage with automatic metering of parts into the vibratory bowl. The unpainted stainless steel bin eliminated the potential for contamination from paint flakes, and the Auto-Kinetics belt conveyor in place of a standard vibratory hopper tray greatly reduced part abrasion while moving between the hopper and bowl feeder. To help achieve the required feed rate and minimize potentially damaging recirculation of parts, we separated the parts into two lines based on their orientation as they exited the inside of the bowl feeder, then merged the lines together for discharge after properly orienting the parts. 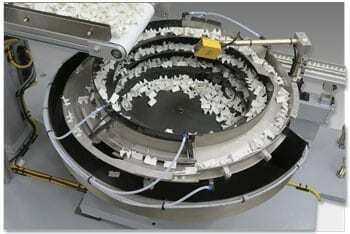 The vibratory feeder bowl was coated with polyarmor and included air jets located to remove excess particulate. A short vibratory straight line track with open tooling and supplemental air jets allowed for final removal of excess particulate. The proximity sensor mounted over the track sensed when the track was full of parts and turned off power to the bowl feeder, helping to minimize damage to parts in the bowl. 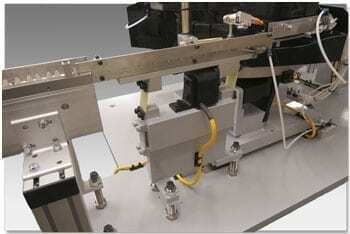 This custom rope belt conveyor delivered the oriented parts to the customer’s machine. 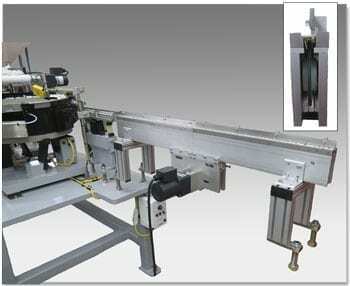 The discharge end of the conveyor was mounted to the customer’s machine. The completed system included a sound enclosure over the bowl feeder and lexan covers over the exposed vibratory track and belt conveyor to keep contaminants out. Doors on the sides and top of the sound enclosure allowed easy access to the bowl feeder. Vacuum connections on the sound enclosure and track cover allowed particulate to be completely removed from the inside of the system. This short video demonstrates the gentle handling of the parts as they are circulated through the feeder bowl towards discharge onto the vibratory straight line track. Input voltage: 220V, 50 Hz. System built using all metric fasteners. Bead blasted stainless steel construction with polyarmor coating. Air jets placed to remove particulate from feeder. 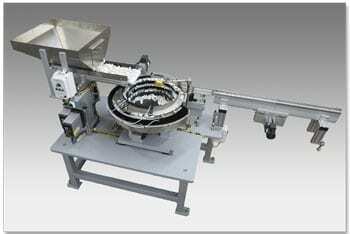 Open tooling design with air jets placed to remove particulate from oriented parts. Custom design with 3/16″ diameter rope belt. Center drive with 1/19 HP 220V AC motor. 3 cubic foot capacity with table mount. 240mm (9.5″) wide x 33.5″ long. End drive with 1/19 HP 220V AC motor. 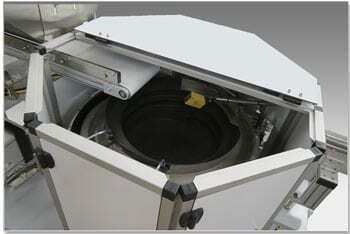 Aluminum frame sound enclosure around vibratory feeder bowl with aluminum composite panels and doors. Lexan dust enclosure around vibratory straight line track. 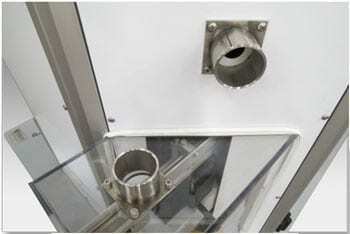 Lexan dust enclosure over discharge conveyor belt. Vacuum tubes installed on sound enclosure and straight line dust enclosure for particulate evacuation. 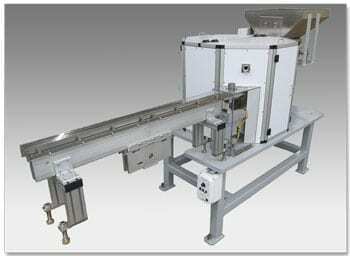 Reovib variable-frequency vibratory feeder controllers for bowl and straight line. KB Genesis AC motor controllers for discharge and hopper conveyors. Mounting surface: 1.25″ thick steel plate with welded mechanical tube frame and leveling screws. Proximity sensor on straight line track monitoring part level in track. When track is full, the bowl is turned off to prevent parts from backing up into the bowl. Proximity sensor on hopper monitoring parts level in bowl, turning on hopper when parts are needed. Solenoid valve package for air jets.